Breast Ultrasound at the ProMedica Breast Care revolves around the high-end breast ultrasound machines. Breast ultrasound is useful in helping diagnose breast abnormalities revealed on a mammogram or detected during a physical exam. 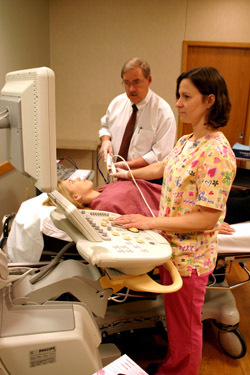 Breast Ultrasound does not use ionizing radiation found in x-rays, but high-frequency sounds waves to produce images. Ultrasound is employed to evaluate the composition of breast lesions, especially when an abnormality is not seen on a mammogram but only felt as a lump. We can also use ultrasound to further characterize lesions seen initially only on MRI. (http://www.arrs.org/pressroom/info.cfm?prID=383). Two breast ultrasound certified technologist are available to assist the radiologist at the BCC.